Delaware Hayes High School Principal Richard Stranges gives a presentation about preparing for the Blue Ribbon of Excellence evaluation to Vice Principal Rex Reeder, right, Hayes Administrative Assistant Susan Backus, left, and Susan Wells, a community member and supporter of Delaware City Schools, middle left. Preparations for the upcoming Blue Ribbon School Of Excellence evaluation are underway at Delaware Hayes High School. Hayes Principal Richard Stranges said that earlier this year, a group of staff from Hayes was asked to present at the Blue Ribbon conference in Florida to discuss the house program that staff implemented at Hayes. Stranges said after the presentation, he arranged for Hayes to be evaluated this fall to determine if it is worthy of the Blue Ribbon of Excellence. 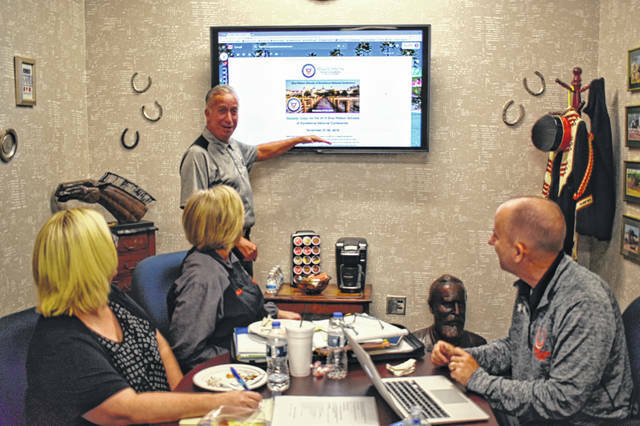 Stranges and several other Hayes officials met Friday to discuss the visit and evaluation, which will take place Oct. 2-3. Stranges said he was proud of the high school and looking forward to the evaluation, because it will give the staff some honest feedback about more than just test scores. Before the evaluation, Stranges said schools are required to send surveys to students and their parents. He’s hoping to get a good response from the surveys, which were sent out last week via email. Scott Stewart, one of the representatives from Blue Ribbon who will be evaluating the school in October, said Friday that he and another official will split up each period and spend about 20 minutes in classrooms. Stewart said the evaluators typically visit about 50 classrooms. Stewart added it’s their job to validate the information in the survey, and he said the auditors will also be speaking to random students during the visit. He said “school culture is gigantic” when it comes to the audit, and he and the other evaluator will “be able to tell in five minutes” what kind of culture a school has. Once the audit is complete, Stewart said all the information they collect and the results from the surveys will be turned over to the school. Stranges said he’s enjoyed preparing for the audit. “It’s been a fun journey,” he said.